Robert C. Hruska, age 90, died on February 4 in Lady Lake, Florida. Bob was born in Nahma, Michigan and married Patricia A. Kelly in 1949 in Kalamazoo, Michigan. 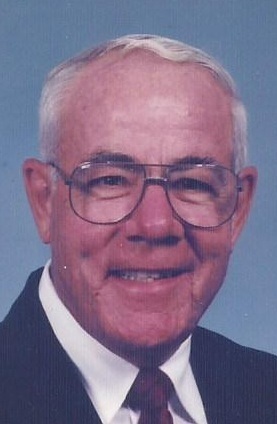 Bob graduated from Western Michigan University in 1953. Bob worked for the Durametallic Corporation (Flowserve) in Kalamazoo for 34 years. He retired in 1987 as Vice President of Marketing and Sales. Bob and Pat moved to Florida in 1990 to The Villages. He was an avid golfer, enjoyed playing cards and traveling. Bob is survived by his loving wife of 69 years, Patricia. He is also survived by five children: Gary of Dayton, Ohio; David (Brenda) of Leavenworth, Kansas; Donn (Sandi) of Southport, Florida; Susan Valentine (Craig) of Portage, Michigan; and Robert E. (Jeni) of Raleigh, North Carolina. He also leaves behind five grandchildren and seven great-grandchildren. He was preceded in death by a daughter, Mary Angela, his parents, and five siblings. Bob led a full life. He served as Church Councilman, PTA President, Cub Scout Leader, Boy Scout Master, Little League Manager, President of the local Michigan Club, Member of Knights of Columbus, Rotary Club, and Elks. He was a member of St. Timothy Catholic Church. Visitation is on Thursday, February 14 from 2:00 to 4:00 pm. With a prayer service at 3:00 pm at Beyers Funeral Home in Lady Lake, FL. A Mass of Christian Burial will be celebrated on Friday, February 15 at 10:30 am at St. Timothy Catholic Church in Lady Lake, FL. To send flowers to the family of Robert Charles Hruska, please visit our Heartfelt Sympathies Store.